Through a research collaboration with Stanford University and other partners, HOT is launching three formal research experiments on crowdsourced damage assessment and is seeking participation from the community. As part of our study, we are conducting in-depth interviews with practitioners experienced in post-disaster activities and users of building damage information. From those interviews, we’ve learned that users of building damage information do not always require that information to be precise at the individual building level. For the purposes of the government-led Post-Disaster Needs Assessment (described in our previous blog post), having accurate information at the district and regional levels is the priority. That insight has guided our development of three experiments that are geared toward better understanding the crowd’s ability to assess building damage from satellite imagery. The first survey is a building-level damage assessment set up in OSM, while the other two are novel area-based damage assessments. The workflow of the first survey should be familiar to all OSM contributors, as it uses the Tasking Manager and a customized version of the iD editor. You are asked to assess each building - identified with a marker on the map - by selecting an estimated damage level based on pre-event and post-event imagery. We encourage you to also participate in the area-based surveys: damage ranks and damage comparisons. 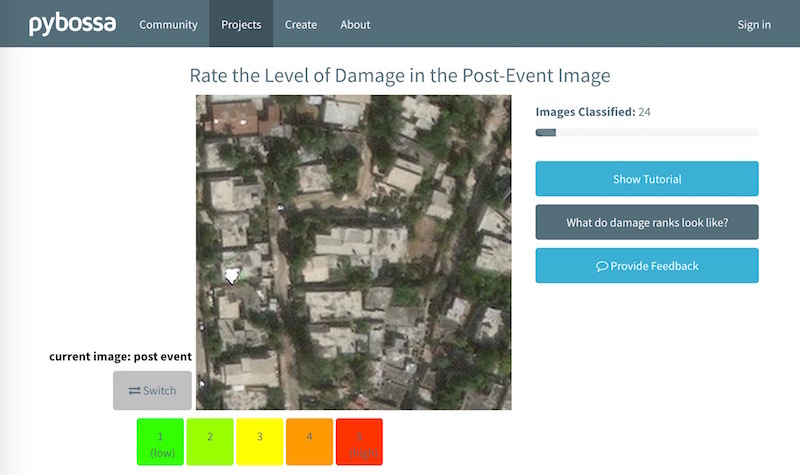 These surveys use the Pybossa microtasking platform, and ask participants to rate the level of building damage in an area or to compare the level of damage in two areas. If you participate in any of these surveys, please also be sure to read this consent notice and to complete the short user background survey (linked to within each damage survey). Thank you in advance for your contributions to this research! If you’d like to share questions or comments, please contact us through the form on the project homepage. We look forward to analyzing the results and sharing our findings with the HOT community. 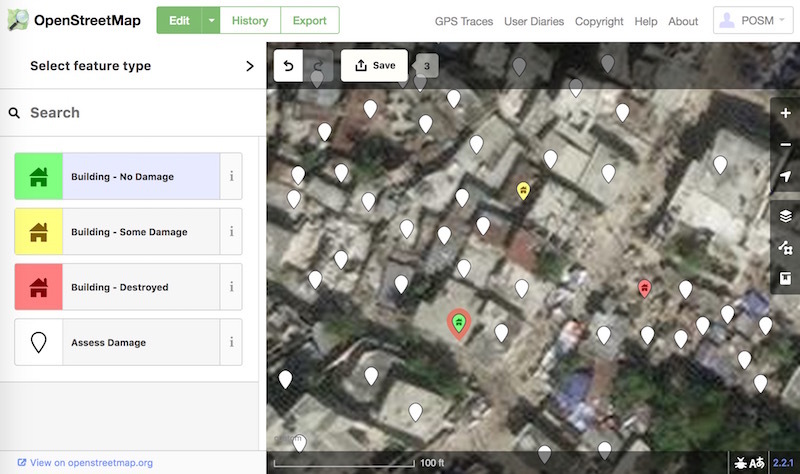 Our goal is to develop a workflow that can be implemented for future disasters and provide actionable information to inform Post-Disaster Needs Assessment activities and HOT activation mapping projects. This project is supported by the National Science Foundation (NSF) grant 1645335/EAGER - “A dynamic, reliability-weighted, multi-pass probabilistic framework to reduce uncertainty in crowd-sourced post-disaster damage assessments”. 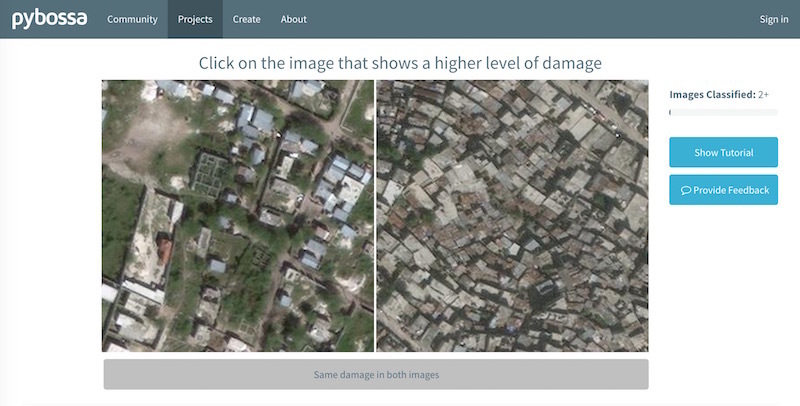 Satellite imagery is kindly provided by DigitalGlobe through the Open Data Program. The Portable OpenStreetMap (POSM) platform used in the building-level damage survey was originally developed by American Red Cross, and adapted for this experiment thanks to invaluable support by Seth Fitzsimmons, Bryan Housel, Nate Smith and David Vasandani. This post was written by Gitanjali Bhattacharjee, graduate student at Stanford University, with contributions from Cristiano Giovando, Karen Barns, Sabine Loos, Robert Soden, Benjamin Herfort, Melanie Eckle, Blake Girardot, and David Lallemant.